Among the first bills introduced this year is HJR 1 which raises two different property taxes on your property! HJR 1 tears down the laws that limit how much you can be taxed on your property. 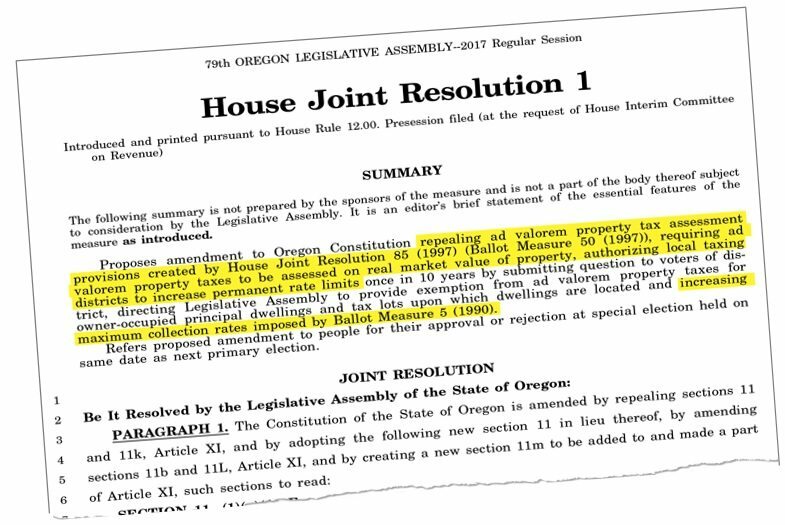 Over 20 years ago voters put in the Oregon constitution two important limits on the government’s ability to tax people’s homes. These sacred measures are Measure 5 (1990) and Measure 50 (1997). Your property taxes are significantly lower today because of Measure 5 and Measure 50. HJR 1 aims to break apart both Measure 5 and Measure 50 to unleash a limitless stream of new property taxes to fill the government tax coffers. First, HJR 1 creates a 20% increase in your property taxes for schools by jacking up the tax cap created by Measure 5 (1990). This alone could cost you $1,500 in higher property taxes. Second, HJR 1 removes the constitutional cap on property tax assessment increases (repeals Measure 50). It changes property taxes to be based on real market value instead of the traditional lower assessed value. This alone could cost you $1,880 in higher property taxes. These two massive tax increases in this one single bill could cost you $3,380 in higher property taxes. – Every single business, restaurant, factory and coffee shop will witness an explosion in higher taxes on the property they stand on. – People lifting themselves out of poverty will be pushed back down and many first-time homeowners will be stuck in a never ending renters trap.